8th February, 2018, Dubai, United Arab Emirates: On what’s considered as the most romantic time of the year, the love smitten couples can think of only one thing “where can I get the perfect present for the love of my life?” If you are running out of ideas and time with your busy schedules, your best solution is here at SOUQ.com, where lovers can avoid the hassle of gift hunting and buy your beloved a gift to cherish. Whether your loved one is your better half, your pet or even your kids, SOUQ has unveiled a huge assortment of gifts for all of them! From gorgeous flowers, scrumptious chocolates, cuddly soft toys and jewelry for your lady love to fashionable clothes, grooming sets and gadgets for your handsome gent to even adorable gifts for your pets! For the couples that celebrate this beautiful day with their kids, SOUQ also has special gifting range for the kiddies. There is no way you can put a price tag on the feeling of love but you sure can on the gifts you purchase. 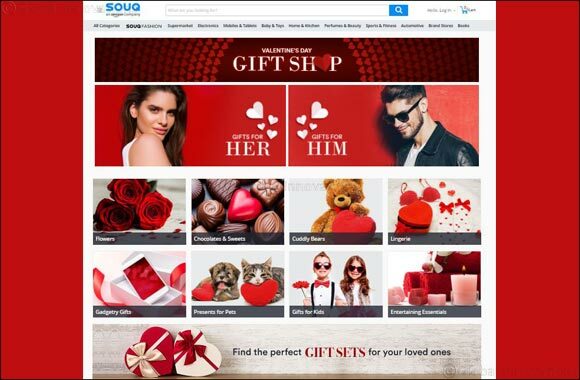 SOUQ’s Valentine’s Gift Shop caters to UAE shoppers with different budgets which range from gifts under AED 100 to gifts above AED 1000 because everyone deserves to feel special on this occasion. There is also a selection of cool gift sets for those who wish to go the extra mile to make their partners feel special. This includes matching couple tees, grooming sets for him and her, the perfect watch set and a lot more to choose from. SOUQ is offering the best of international brands at incredible deals with easy payment options and same day delivery too. So this Valentine’ Day go straight to the top of the star-gifting stakes with SOUQ’s stunning range of gifts at click of a button to have it delivered right at your doorstep or to your beloved’s workplace.